The annual golf outing took place on 18 September at Elm Park golf club on a lovely sunny, balmy day. It was the day before storm Ali hit our shores so there was a good bit of advance wind which made conditions challenging. There was the usual small field consisting of eight players – Gerry Morrissey, Karen Rothwell, Don Briggs, Liam Kelleher, John Lennon, Alan Dixon, David Strahan and John McGuire. John Lennon, playing off a 13 handicap, played wonderful golf on the front nine, shooting seven pars to score 22 points and sail into a commanding lead. The back nine proved to be a more difficult test and he went on to add a further 15 points for a total of 37 points to win easily from John McGuire and Alan Dixon who finished second and third respectively. 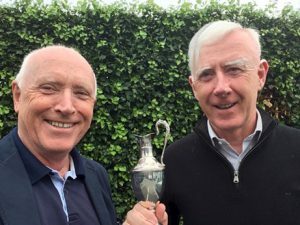 The Claret Jug was presented to John in the clubhouse afterwards whilst the others drowned their sorrows in pints of beer and fine red wine.